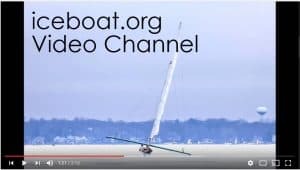 Lake Winnebago stern-steerer sailors Andy Gratton and Mike Kroll might still be on the search for ice so that they can add to their 1000 mile season. Ice is rare this time of year but they did drop in to visit with an iceboater from Lake City, MN. “Mike Kroll and I were in Rochester and stopped to see Bruce Eggenberger, a long-time stern steerer sailor at Lake City. He had this photo from his uncle who used to ice boat there. The story is that most of these boats were all stored in the same barn. Some irate wives of the iceboaters burned the barn one night. Silly them, they didn’t realize the boats were keeping their husbands out of the bars. I bet it was Bob’s wife because he didn’t name the boat after her”. 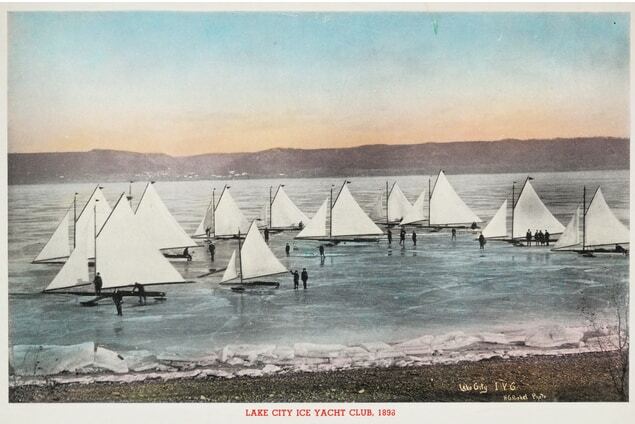 In a related story, a few years ago, Harry Allen sent a link to this Lake Minnetonka Magazine article written about the iceboating scene on Pepin and Minnetonka in the 1890s. The story details a race between the Pepin and Minnetonka stern-steerers with the winning skipper of the race being a 17 year old girl, Nancy Bassett.